In pediatric practice, 18F-FDG PET/CT is now considered standard of care for the diagnosis, staging, and posttreatment response assessment for an increasing number of pediatric malignancies. The relative rarity of pediatric tumors, availability of PET/CT scanners, and development of pediatric-specific protocols have contributed to the slower standardization of PET/CT practices in the pediatric population as compared to adults. Other pediatric-specific challenges, including radiation concerns, use of IV contrast, and requirements for anesthesia, must also be addressed. 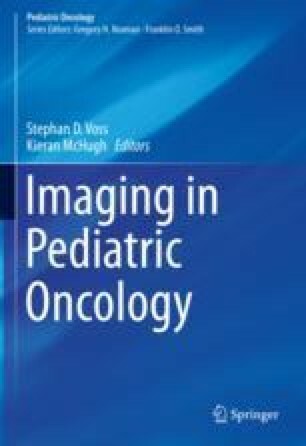 This chapter will focus on the use of 18F-FDG PET/CT, protocol options, and normal variations in the pediatric patients, in addition to reviewing the evidence-based literature for specific pediatric cancer types and tumor-like non-cancerous lesions. Recent advances in hybrid PET technology are also presented, with an emphasis on the role these technologies play in driving development of molecular imaging techniques and their application to personalized and targeted approaches to pediatric cancer care. Cherry SR, Badawi RD, Karp JS, Moses WW, Price P, Jones T. Total-body imaging: transforming the role of positron emission tomography. Sci Transl Med. 2017;9(381) https://doi.org/10.1126/scitranslmed.aaf6169. Flerlage JE, Kelly KM, Beishuizen A, Cho S, De Alarcon PA, Dieckmann U, Drachtman RA, Hoppe BS, Howard SC, Kaste SC, Kluge R, Kurch L, Landman-Parker J, Lewis J, Link MP, McCarten K, Punnett A, Stoevesandt D, Voss SD, Wallace WH, Mauz-Korholz C, Metzger ML. Staging evaluation and response criteria harmonization (SEARCH) for childhood, adolescent and young adult hodgkin lymphoma (CAYAHL): methodology statement. Pediatr Blood Cancer. 2017;64(7) https://doi.org/10.1002/pbc.26421. Cheng G, Alavi A. Value of 18F-FDG PET versus iliac biopsy in the initial evaluation of bone marrow infiltration in the case of Hodgkin’s disease: a meta-analysis. 2013. Nucl Med Commun. 34(1):25–31. https://doi.org/10.1097/MNM.0b013e32835afc19. Borinstein SC, Steppan D, Hayashi M, Loeb DM, Isakoff MS, Binitie O, Brohl AS, Bridge JA, Stavas M, Shinohara ET, Meyer WH, Reed DR, Wagner LM. Consensus and controversies regarding the treatment of rhabdomyosarcoma. Pediatr Blood Cancer. 2018;65(2) https://doi.org/10.1002/pbc.26809. DuBois SG, Mody R, Naranjo A, Van Ryn C, Russ D, Oldridge D, Kreissman S, Baker DL, Parisi M, Shulkin BL, Bai H, Diskin SJ, Batra V, Maris JM, Park JR, Matthay KK, Yanik G. MIBG avidity correlates with clinical features, tumor biology, and outcomes in neuroblastoma: a report from the Children’s Oncology Group. Pediatr Blood Cancer. 2017;64(11) https://doi.org/10.1002/pbc.26545.